In 1916, with a population of about 100 families, the citizens of Valley Center petitioned the Board of Supervisors to establish a library branch in their community. On September 15, 1916, that “branch” welcomed it’s first patron. The branch was actually one shelf of books inside Valley School, site of the present-day Community Hall on Lilac Road. Once each month, a County worker changed the books. A few months later, the books were moved a few yards up the street to the Valley Center Store and Clara Holcomb Shelby, Postmaster and proprietor of the general store, would serve as the librarian, called “custodian” for the books by the County. This would remain the library site for 12 years. For the next 44 years, the Valley Center library would move twice into other local markets, until 1961 when a Bookmobile took over. With a 1970 population of almost 4,000, the town got its first full-service branch in a shopping center on Valley Center Road. The library eventually occupied three storefronts with a combined floor space of 2,700 square feet. In 2002, the branch moved into its current home, a state-of-the-art building of 14,000 square feet. The branch houses a collection of more than 52,000 volumes and related materials, and annually circulates some 140,000 items. There are 14,300 cardholders. 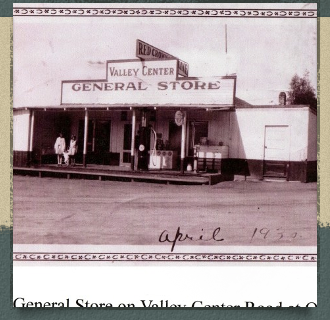 A complete history of the Valley Center Branch Library, including documents and photos, is maintained by the Valley Center Historical Society at the History Museum, which shares the four acre library campus. The archive includes the original 1916 petition signed by 50 citizens.